Colada de avena con naranjilla: Colada de avena is a typical drink from Ecuador made with oats, naranjilla fruit, panela or brown sugar, water and cinnamon. Colada Morada: Colada morada is a traditional Ecuadorian drink made with fruits, spices, and purple corn flour. Canelazo: Canelazo is warm spiced cinnamon cocktail made with cinnamon, water, sugar and aguardiente. Chicha de piña: Chicha de piña is a spiced pineapple drink made by simmering the pineapple skins and core with hard brown sugar and spices. Naranjillazo: Naranjillazo is a version of canelazo made with naranjilla fruit juice. Hi and thank you so very much for your wonderful receipts. I grew up in Quito and my grand used to take us to El Mercado Central to a lovely lady that made a wonderful drink every Sunday. I think the drink had: Pilsener, eggs, sugar and some green leaves. 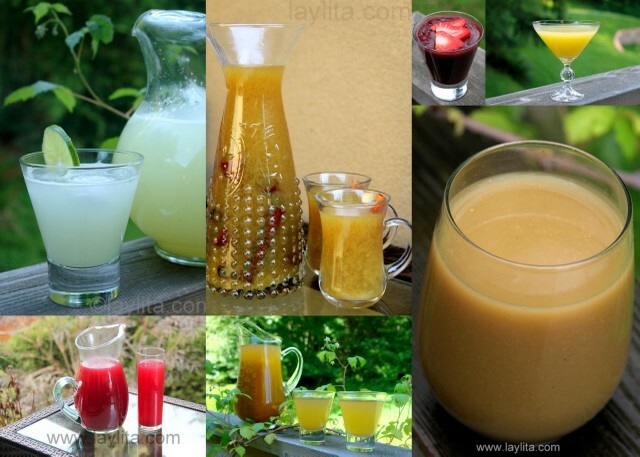 Do you know or heard of this drink if so, please would you let me know so I can make it for my kids. Hi Grace – We had something similar at the mercado in Loja. I usually avoided that one (or any green ones with eggs), though if I remember correctly the green leaves were usually alfalfa. My favorite was the carrot/beet/orange juice drink. My mom was more adventurous, I’ll ask her if she can confirm what’s in the one you mentioned. I remember having something like what you describe, minus the green leaves, at Mercado de San Roque. We used to call it ponche de cerveza con huevos. I think it was just beer, milk, raw eggs, sweet spices, and sugar, all mixed together in a blender and served in tall glass mugs! Very foamy and DELICIOUS!! I just got back from studying abroad in Ecuador. It’s such a beautiful country. Do you have a good recipe for caipirinha? Or, do you have a recommendation as to which brand of caña is best? I’m on a hunt to find caña in the USA and some websites sell Zhumir, but I’m not sure if that’s the best. Any thoughts? My friend from Brazil makes the best caipirinhas and I’ll share her recipe (and technique). I don’t have any specific brand recommendations for aguardiente or cachaca. I usually bring a bottle of Zhumir back from Ecuador, more for nostalgia than quality, and usually buy Colombian aguardiente in the US (since it’s the easiest one to find). There are a lot more options for cachaca, but I’m not an expert on the “best” ones – I’ll ask my friend for some recommendations when we make the caipirinhas.